pudding or stuffing that was gluten free. That was of course was until I heard what The Farm Tavern, located on Farm Road, was serving every Sunday and boy was I in for an exciting treat! 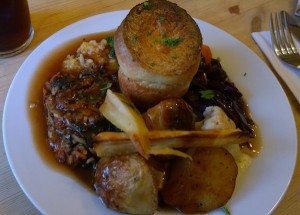 I had been once before a few years ago as my boyfriend was very pleased with their selection of veggie and vegan roasts because they are always something a little different to the usual standard nut roast or vegetable Wellington that you are often presented with and you always have more than one choice. 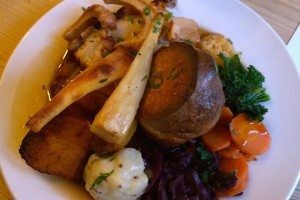 We hadn’t really been out for a Sunday roast for a long time, but on this particular Sunday I requested that we head back to The Farm to try their gluten free roast offerings as I had heard really good things! We were set to arrive later in the afternoon, around 5pm, and had booked a table which was lucky as it was nice and busy – it was obviously a popular place! The main clientele seemed like they were locals and regulars, so there was a lovely welcoming and homely feel to it, which is what I like when I’m out for a Sunday Roast. The menu had a choice of four different meat options and a whopping three different vegetarian roasts to choose from, two of which were vegan. For the meat you could try the sage and cider roast belly of pork with crackling, garlic and lemon chicken with sage and onion stuffing (GF), cumberland glazed leg of lamb, or corner cut topside of beef with salt and pepper crust. The vegetarian options were: sun-dried tomato and spinach cashew nut roast with cheese, spiced butternut squash and mushroom wellington, or caramelised onion and rosemary sausages. All have gluten free gravy, as well as an option to have a Yorkshire pudding that is both vegan and gluten free! I told you this was going to be an exciting treat! 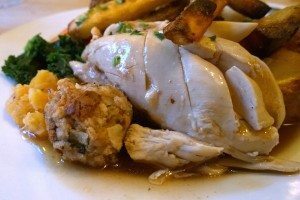 I decided to go for the chicken with stuffing, as I absolutely LOVE stuffing, and hardly any pubs serve it with their roasts, and if they do, it is never gluten free. My boyfriend went for the nut roast, and my friend chose the sage and cider slow roasted pork. We didn’t have to wait long, the service was quick, which was good as I had been saving my appetite for this all day! The portions were very generous, and they came with 7 different types of veg on each plate! There was braised cabbage, cauliflower cheese, carrots, kale, roast potatoes (of course), roasted parsnips and swede mash. I had so much chicken, and it was all really juicy even though it was the breast. There was a small stuffing ball, that was herby and crisp, and the Yorkshire pudding was perfectly round and risen, with a little pool of gravy in the middle. It was really hard to believe that it was gluten free, I was very impressed! Every vegetable was cooked with care and shone on their own. The cabbage was sweet with just the right amount of acidity, the cauliflower had flecks of mustard seeds and the white sauce was creamy; the parsnips were sweet and golden and the kale was kept simple and lightly steamed. The roast potatoes were evenly cooked, golden and crispy, and were definitely up there with the better roasties that I have had in Brighton! The gravy was light, as there was no flour it wasn’t thick, but added a nice subtle flavour to the plate. My friends pork was lovely and juicy, there were a couple of slices which was plenty, and the crackling was nice and crunchy so I had to steal a piece. The regular Yorkshire was well risen, and slightly crispy on the outside with a fluffy and slightly chewy middle. My partners nut roast was also of a decent size, and was very delicious, much better than the standard nut roasts you would find anywhere else. It was cheesy and packed with sun-dried tomatoes so he was very pleased with his choice. Now I rarely ever have room for dessert, and that day was no exception, although my favourite pudding in the whole wide world was on the menu and for once it was gluten free! Lucky for me, both items on the dessert menu were gluten free so we decided to get one of each to share between the three of us. 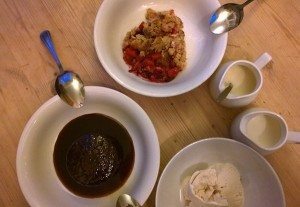 The two options to choose from were sticky toffee pudding or mixed berry crumble. With the crumble you had a choice of custard, ice-cream or cream but as none of us could decide so we were offered a small side of each which was nice! Even though I was full, I was very pleased to see the sticky toffee pudding arrive and it looked perfect. It was light and fluffy, and the sauce was sticky and sweet. The vanilla ice-cream went really well with it and you would never have known that it was gluten free! I was so happy and totally in my element, sticky toffee pudding was my absolute favourite and this one was particularly very good, I did not want to share. The crumble was rustic and packed with berries, with a crunchy topping of oats and gluten free flour, and was very tasty with the homemade custard that we had on the side.